As part of my PhD, I used Crossbow TelosB Motes to form a wireless sensor network. This page gives a very basic example of how to download and compile the source code for the motes in a standard accepted way. Installation of the TinyOS system is pretty straight forward, following the TinyOS Install Instructions. The Two-step Debian install was what I used for my Ubuntu 11.04 office PC. For completeness I will repeat it here. This page assumes you’re running a Linux distribution that supports Debian packages and the advanced packaging tool (APT). Remove any existing APT source entries. Add the following line to your /etc/apt/sources.list source file. On the newer versions of Ubuntu, tested on 12.04, you can apt-get install all of the MSP430 stuff. 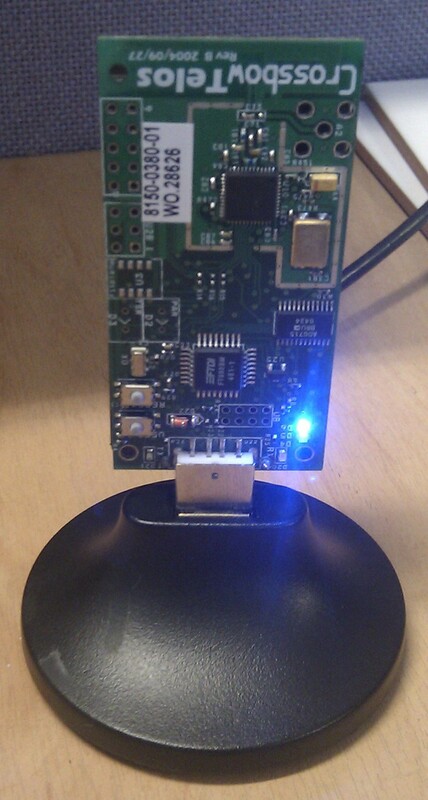 Thanks very much to http://pfalcon-oe.blogspot.co.uk/2012/03/developing-for-ti-launchpad-msp430.html. This saved me a lot of time recently. The old method of installing these had me compile many of the programs from source and all the associated problems. The job went from being 2 hours of work, to about 20 seconds! This application is the de-facto test program, and demonstrates how to get from source code to a running mote. You can download this example program. You need to get all the files in the folder, and save them in the same folder, which will become your project’s working directory. Once you’re in the working directory, open a terminal there. Compiling the program is as simple as issuing the make command. Here, I am using a Crossbow TelosB mote, and so I pass the telosb argument to make. mica or whatever also works. If the build was successful, it will look as above. If not, you will know about it. The mote is easily programmed again with the make command. Before we program the mote, we can get a list of all those connected by using the motelist program. The above is what programming my TelosB mote looked like. Once the programming has finished, the mote should start running. The image below shows the mote with the blue LED on. When mote runs with all 3 (blue, red and green) LEDs flashing at different rates. This issue is caused by nesC versions 1.3.2 and older versions when it tries to compile with gcc 4.6.
add option -target=iris (or telos or whatever mote you’re using, it doesn’t really matter, the generated code is the same) to the mig command to use avr-gcc or msp430-gcc instead of gcc. This issue (for me) was caused by something up with the tinyos.jar file. That solved my issues with the cannot find symbols error.